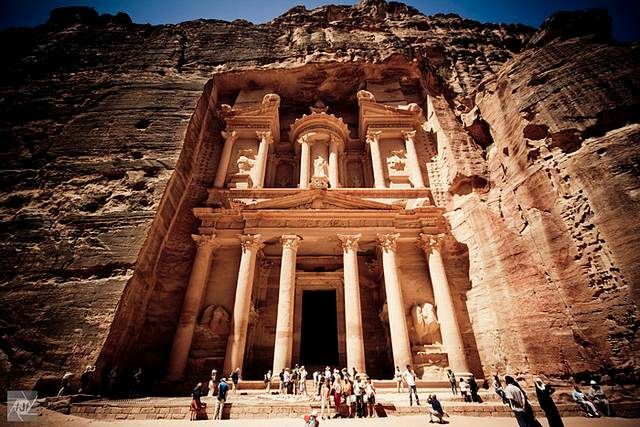 Visit amazing Petra together with the fascinating desert of Wadi Rum. Transfer from TLV/JLM to the border with our professional assistance. Cross into Jordan and head to Petra through the amazingly beautiful Israeli Negev Desert region, with sunrise in the desert, and the spectacular desert scenery along the way to illustrate your journey. Tour the amazing site of Petra (entrance fee included), including the important highlights that this wonder of the world holds. Eat Lunch at local authentic Jordanian in Petra. Return to Tel Aviv / Jerusalem. 08:30-09:00 Border crossing includes: border control and customs. * This process may take up to 2 hours, so your patience is required and appreciated. Transfer from the border to Petra in our newest models of air- conditioned vehicles. The Transport time is approximately 2-3 hours, passing through a vast and comfortable highway (the "Desert Way"), following through a scenic route on the mountain side, and arriving at Petra's historical site, known as one of the Seven Wonders Of The World. The tour of Petra begins at the entrance to the site. Included in your package is an optional horseback riding for the first 200 meters of the route. The ride allows you to taste the unique atmosphere of the place (tipping the carrier is required, ranging from $2- $5 (USD) at your discretion). 16:15Lunch at a local authentic restaurant. 17:00 Transport to the hotel in Petra. You can enjoy a free evening in Petra. Breakfast at the hotel, and free time to explore Petra and the authentic market. We begin our return trip towards the border. This route includes a few stops along the way at certain observation points, in order for you (the traveller) to enjoy the beautiful landscape Wadi Rum has to offer. Arriving in Aqaba for a short panoramic tour of the city. Transfers in new model air-conditioned vehicles. Lunch at a local restaurant in Petra. Room rates are charged at Per Person rate. You will be sharing rooms. To change your room to a single room there is an additional fee of $38.00 (USD). Option for transportation to the hotel in Aqaba before 19:00 for an additional fee of $15.00 (USD). - Please register with the exact information that is written in your passport. - Payment for the trip by credit card, or wire transfer must be made before the tour. - Payment by cash in dollars or New Israeli Shekels (at the high rate) can be made on the day of the tour.